from PM’s CC Vol II. 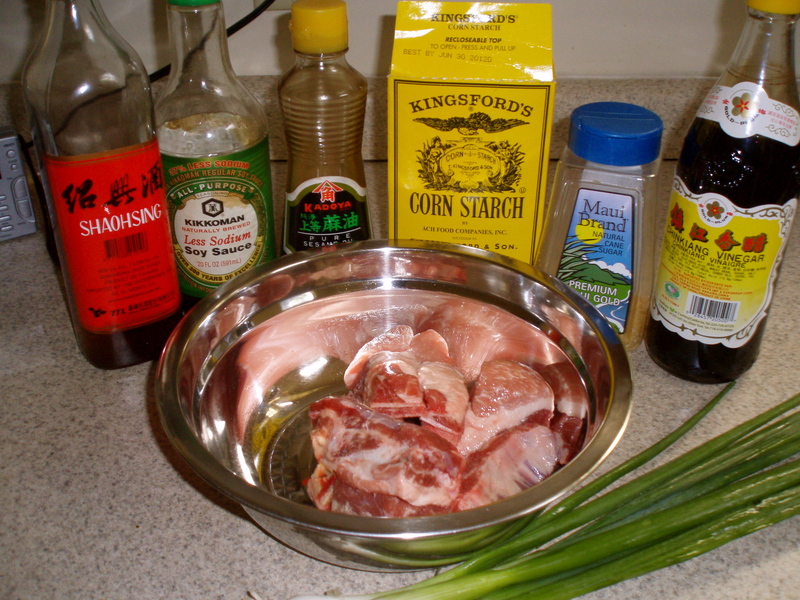 Easy way to prepare ribs: saute a little sauce and pour over raw meat, then steam in the rice cooker. The flavors were just as intense as you’d get with a stir-fry: salty from the fermented black beans, garlicky, spicy. I didn't have fresh chili peppers, so I chopped up a few dry ones. I chopped each rib strip into 1-in segments. 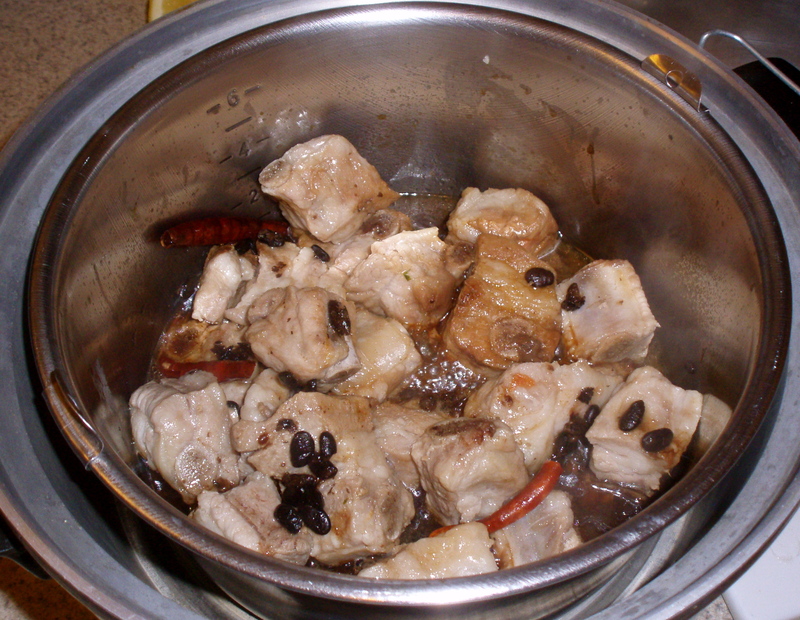 The sauce is made by stir-frying the (soaked and cleaned) black beans with soy sauce, sugar, salt, and rice wine. This happens really fast, like in 10 seconds. Then the sauce is mixed with the meat in the rice cooker bowl along with a little cornstarch. Chopped garlic and chili pepper are placed on top and the whole thing is steamed for 20-30 minutes until the meat is cooked through. from PM’s CC Vol I. I’m not usually a huge fan of sweet and sour stuff, especially when I have to fish for bits of meat swimming in a gooey sauce. This recipe pleasantly surprised me. Spareribs surrounded by minor players. The ribs should be chopped into 1-inch cubes. I asked the meat counter man to saw through the big bones for me and easily cut everything down to size at home. The pork is marinated in soy sauce and rice wine for half an hour, then PM has a complicated deep fry then shallow fry deal going on that I decided not to do. I stir-fried the meat in hot oil until brown and cooked through. 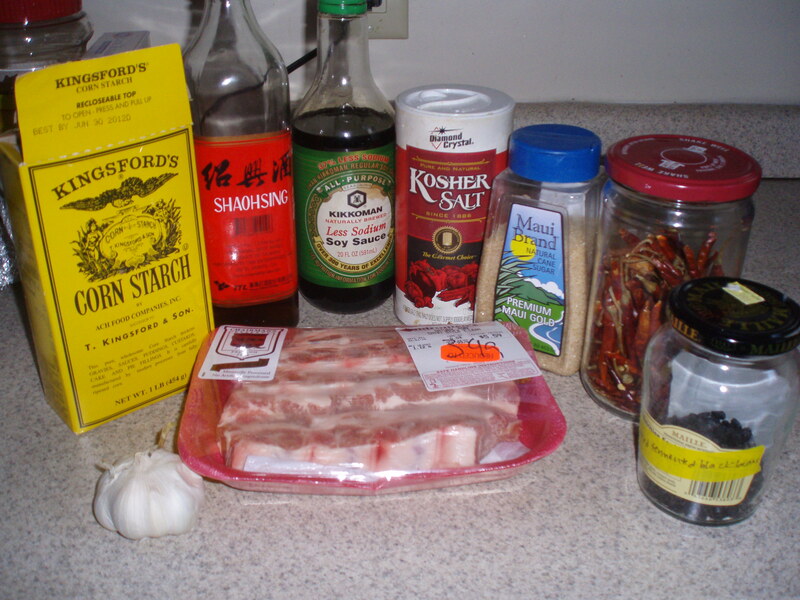 The leftover marinade is mixed with sugar, cornstarch, sesame oil, and shredded scallion. 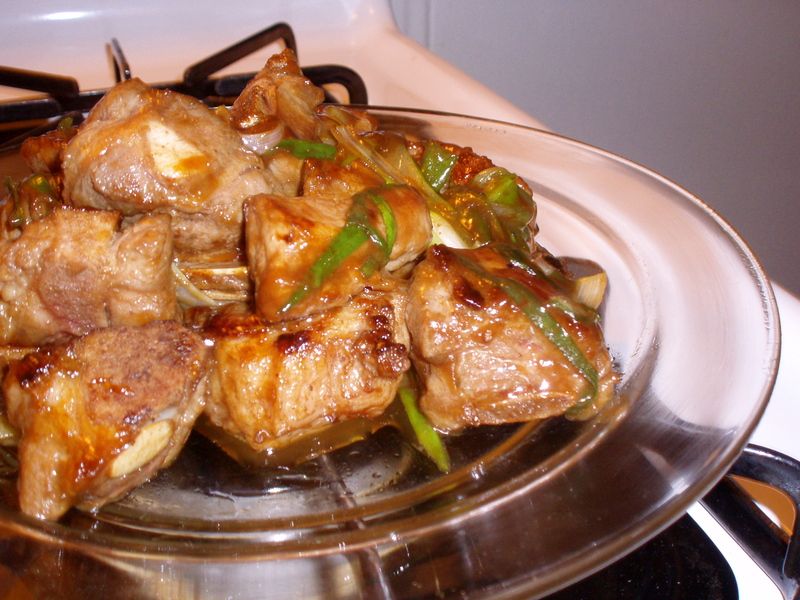 The sauce is quickly cooked in the left-over sparerib-frying oil until thick, then the meat is added and everything is tossed to coat. 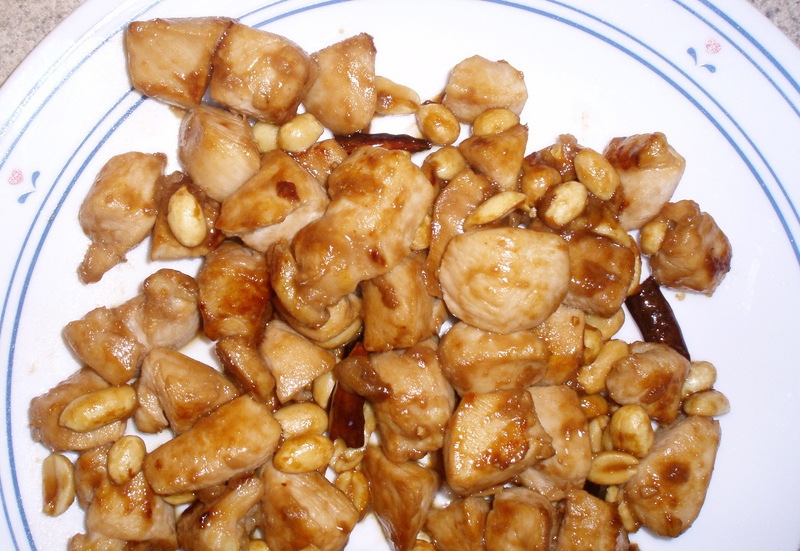 from PM’s CC Vol I. Kung Pao chicken! I found the flavors to be very basic, with a kick from the dried chili peppers and a crunch from the peanuts. I prefer stir fries with more vegetables, so I don’t think I’ll be making this regularly. Chicken, peanuts, and chili peppers. The biggest hassle was de-seeding the chili peppers. This may be easier with the large chilies PM recommends, the kind about an inch wide. I used 3 small chilies, which provided only a little bit of heat. Methodology followed the basic stir-fry procedure. Marinate cut chicken in soy sauce and wine, then stir fry to 90% done. In a small bowl, mix soy sauce, sugar, and corn starch. 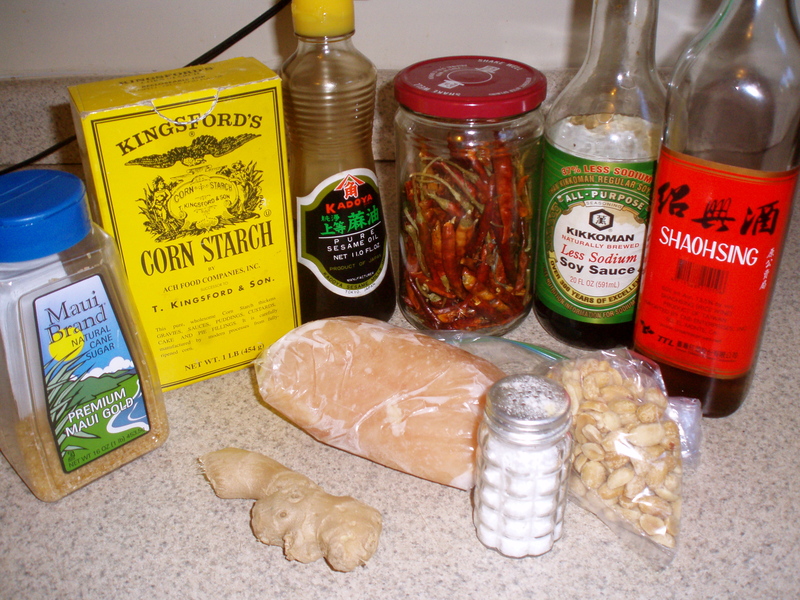 Fry chilies, pour in sauce, stir until thick, add chicken and ginger, stir to combine, turn off heat, toss in peanuts, mix well, and plate. from PM’s CC Vol II. Rich peppery duck is steamed with sticky rice with mushrooms, sausage, shrimps, and lotus seeds. Takes a long time but everything is steamed, so it could all be done in the rice cooker! I was hoping there was a gizzard in the paper package, but it was just a lost chicken neck. This puppy takes a long time, but not much of it is active. The dried lotus seeds need to be soaked for a long time in cold water (I did overnight), then individually examined to remove any green shoots, which are bitter. The duck is steamed for an hour, then de-boned. I also prefer to remove the skin, which is extremely fatty. The deboned duck is cut into bite-sized pieces and attractively arranged in the bottom of a bowl. Seasoning sauce is poured around the edge. The mushrooms, lotus seeds, sausage (or ham), dried shrimps, and gizzard (I didn’t find one in time) pieces are sauteed together, rice wine and soy sauce are tossed in, and the glutinous rice is mixed in. The rice mixture is packed on top of the duck, and the whole thing is steamed a second time for about an hour. The rice cooker was busy steaming other things, so I went for the stovetop method: put a few cups of water in a wok or large pan, then place some sort of supporting device (like a metal stand) on the bottom. Put the bowl of food on the stand, cover, heat the water to a simmer and steam. Sometimes a little juggling of metal stand and cover is needed to make sure the steaming chamber is relatively sealed (cookie cutter and cookie sheet FTW this week). Once the steaming is complete, the bowl is inverted onto a plate. The bowl’s very hot and there’s some splash-happy liquid in there, so be careful! Difficulty level: deboning the duck can be a bit messy, and requires patience. That’s why I got someone else to do it. So it was a little messy to decant. from PM’s CC Vol II. Sticky rice, sweet red bean paste, and grated coconut on the outside…not the easiest dim sum to wrap but well worth it. Glutinous rice is that sticky stuff mochi is made from. Red bean paste is a sweet mashup of stewed azuki beans. Coconut is coconut, grated. PM also asks for 2 maraschino cherries, to be cut up and carefully placed on top of each rice ball. While that would be very pretty, I really can’t justify purchasing an entire jar of maraschino cherries to use two. I did try using a cut up raisin but it kept on falling off. PM’s proportions on the dough are a little strange: her directions don’t call for nearly enough water to bring the dough together. I’m not sure how much more water I used; I think it was an extra half cup of boiling water and then cold water as needed to make a dough. In terms of wrapping, I think the key is that the dough not be too dry (though it shouldn’t be gloppy either). It should just be damp enough that it doesn’t crack apart if you rip off a piece and press it. PM says to cut the dough into 20 pieces; each piece should be the size of a small egg. You can roll it in your hands and flatten it with your palms, keeping the center thicker than the edges. No need to cut the red bean paste into 20 pieces either. My red bean paste was too wet to be cut anyway, and I just scooped about a teaspoon onto each wrapper. Gather the wrapper together like so, and gently roll it into a smooth-ish ball. It doesn’t have to be perfect, just try not to let the filling escape from the wrapper. For the steaming step, be sure to grease the bottom of the pan where you’re placing the rice balls. I steamed these in two layers in my rice cooker; rice balls from the top layer came off the pan easily, but there were some serious sticking issues for the bottom, which is closer to the heat source. If you’re steaming with a water bath on the stovetop, sticking shouldn’t be an issue. As you de-pan the rice balls, roll them in the grated coconut. Try to keep the un-coconut-ed ones covered in their steam bath, because if they dry before the coconut treatment, the coconut won’t stick, and that would be very sad. PM says to wait for these to cool before serving, which is probably a good idea because the filling is very hot. Unfortunately the rice balls hardened up overnight, so I’d advise consuming them all the same day (an onerous task indeed). Hardened rice balls can be salvaged by covering with a damp paper towel and nuking in the microwave for 30 seconds or so. from PM’s CC Vol I. PM means “spicy” not in the “flamethrower in the mouth” way but in the “ahoy, spices from the East Indies!” way. Slices of fish, either fillet or steak, are marinated in soy sauce, fried, and dunked in a soup of sugar and Chinese five spice for a tender, salty/sweet mouthful. 蘇式 su1shi4 — Su Shi was a famous Chinese poet from the Song dynasty. Apparently also quite the foodie. A recipe of few ingredients. Since the recipe starts out with a 4-hour marinade, I’d suggest planning ahead for this one. I’d also suggest stirring the marinading fish occasionally for even coating. As for type of fish to use, PM says any firm white fish will do; the photo in her cookbook shows something with bones, but I used basa fillets (on sale). After the marinade with soy sauce, wine, scallion and ginger, we “deep fry” the fish. I stir fried with a little oil. PM says to fry 3 to 4 minutes until the fish is dark brown; just make sure the fish doesn’t burn. I pulled mine out at the slightly-browner-than-golden-brown stage. The next step is helpful if you have boiling water on tap, like in a hot water heater. Quickly mix the brown sugar and five spice with the water to make a sepia-toned soup, and drop the fish slices in as they come out of the stir fry pan. The fish gets to sit in here for another 3 to 4 minutes, when you can take them out to plate. PM suggests waiting for the fish to cool before serving; I thought it was pretty tasty hot as well. Difficulty level: stir frying is the hardest, and it wasn’t that hard. Not quite as dark as it should be, but still tasty. from PM’s CC Vol I. Large chunks of chicken are stewed with soy sauce and chestnuts; the chicken is slightly sweet and tender, and the chestnuts will be too if you cook them long enough. Dried chestnuts in the brown bowl. On the subject of chestnuts: PM says we can use fresh or dried. Fresh ones would have to be peeled, and dried ones, which come pre-peeled, should be soaked in warm water for half a day until smooth. Well, I soaked mine a full 24 hours and they still weren’t smooth; at the end of cooking, they were still a bit crunchy and hadn’t softened quite enough. Next time I’d either soak for two days or make sure the soaking water is always warm. In other news, PM calls for half a chicken and here I used drumsticks, which worked well. PM tells us to marinate the chopped chicken with soy sauce, ginger, and scallion; deep fry the chicken pieces; then stew with the chestnuts, leftover marinade, sugar and water. Instead of deep frying, I shallow fried in a little oil, turning the chicken pieces to brown evenly. As for the stewing, PM says to stew, covered, for 40 minutes. She says the sauce is supposed to reduce. Well…not so much, even cooking uncovered for the last 20 minutes. I also found 40 minutes to be on the short side for cooking the drumsticks; next time I’d go for an hour, mostly uncovered, stirring occasionally to submerge the chicken in the sauce. Difficulty level: do you have tongs? frying chicken is easier with tongs than with chopsticks. If only I'd remembered to garnish with parsley.